There’s been some awesome news in the cat world. Purina’s teaming up with Cats Protection for an Unadoptable Campaign—showing the world that no cat is unadoptable. Cat parents and their felines are sharing their stories of adversity, whether medical or age-related, and demonstrating how all cats deserve a good, loving home. I absolutely love special needs and senior kitties and have recently had the privilege to design a very special houseboat catio for two cats with Cerebellar Hypoplasia, known as CH by the folks who love these kitties. CH is a rare congenital condition that causes kittens to be born with various levels of mobility challenges. Depending on their level of mobility, these cats can often live full, long and healthy lives, with just a few extra precautions around the home. Because the condition is fairly rare, people unfamiliar with the condition often grimace when they first see these cats move, fearing they’re in pain. However, the condition is not progressive and mild and moderate cases often live very normal cat lives. These cats CANNOT ever be indoor-outdoor cats because of their condition, making them especially wonderful candidates for catios. (Find out more about the condition here). My client Anna Boyd adopted the 1 year-old littermates, Rosemary and Boots, from the Seattle Humane Society. Both have moderate CH and live on a houseboat in Lake Union where they enjoy fresh air and the stimulation of the outdoors while safe in their catio. For Boots and Rosemary, I set out to design a fun and functional space that accommodated all their mobility issues and complimented the houseboat lifestyle! Two metal cats adorn the human-sized door and the peak of the red “cat house” structure. The catio was painted purple with red accents to complement Anna’s purple front door and red metal roof. Altogether, the effect joins together goals of feline enrichment and human enjoyment. It was an absolute joy to create a catio for these special needs cats. Want to see more of this unique houseboat catio? Check out behind-the-scenes footage of its construction and learn more about cerebellar hypoplasia cats here. Many thanks to Anna for entrusting me with this complex design! They’re still many catio clients on the horizon, but this is definitely a stand-out for the season! If you have a special needs or senior cat and want to create a safe and enriching outdoor space, I’d be more than happy to jump on board with the design project. 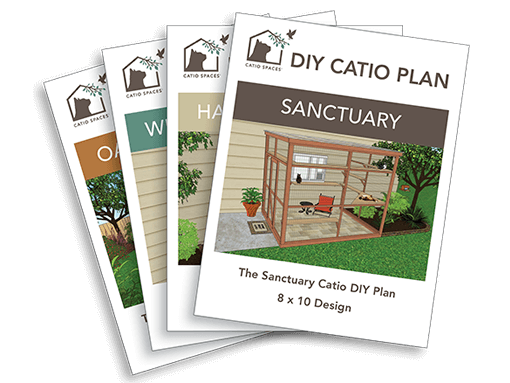 Otherwise, see our free catio tips and consider a downloadable DIY plan that can accommodate different family sizes and types of homes, from a simple window box to a catio space where you can enjoy bonding with your cats. And, as always, life is good in a catio!